Wednesday, 30th July 2014 - மிகச் சிறந்த நன்னாள் ! ஸ்ரீ ஆண்டாள் அவதரித்த தினம். 'திருவாடிப்பூரம்' ஸ்ரீவில்லிபுத்தூரில் பெரியாழ்வார் பெண்பிள்ளையாய், நந்தவனத்தில், துளசி மலரில் பூமிபிராட்டி அம்சமாய் தோன்றிய கோதைப் பிராட்டியின் பக்தி அளவிட முடியாதது. தன் இளமை தொடங்கியே 'மானிடவர்க்கென்று பேச்சுப்படில் வாழகில்லேன்' என உறுதி பூண்ட பிராட்டியின் பக்தி திருப்பாவை, நாச்சியார் திருமொழி நூல்களாக வடிவெடுத்தது. ஆண்டாளை அனுதினமும் சேவித்து,ஆண்டாள் அருளிச்செய்த பாசுரங்களை பாடி திருமால் அடியார்களை மகிழ்வித்து, ஸ்ரீமான் நாராயணின் அருள் பெறுவோமாக !! This year Thiruvadipuram falls on Wednesday, 30th July 2014. Andal was born in the month of Aadi; found in a thulasi garden at Sri Villiputhur by Vishnu Chithar [Periyazhwaar]. Our Acharyar in his ‘Upadesa Rathina Malai’ hails the day as ‘Periyaazhwar pen pillaiai Aandal pirantha thiruvadipurathin seermai’. Uyyakkondar says in the thanian visualizing Srivilliputhur as a very special Divya desam where Hamsam [anna pakshi] known for its power to separate milk from water are abundant and hails Andal for the verses with which she offered garlands to the Lord. Sri ANDAL, quintessence incarnation of Shri Bhuma Devi, the divine consort of Sriman Narayana, sang thirty sweet songs containing the cardinal principles of Sri Vaishnava Dharma. Other than Thiruppavai which is specially sung in all the days of the month of Margazhi, She also gave us 143 verses known as ‘Nachiyar Thirumozhi’. Her philosophy is clear and unmistakable propagating that - "Sriman Narayana is our refuge now and forever ~ He will never let us down, for we are His possessions". Andal Thiruvadigale Saranam; Azhwar Emperumanaar Jeeyar Thiruvadigale Saranam. Andal composed two works unique in their literary, philosophical, religious, and artistic content. One is Tiruppavai, a composition of thirty verses in which Andal imagines herself to be a cowherd girl during the incarnation of Lord Krishna. This is recited in all temples daily, especially during the month of Margazhi. The second is the Nachiyar Tirumozhi, comprising of 143 verses. This year Thiruvadipuram falls on Wednesday, 30th July 2014. The 10 day Thiruvadi Poora Uthsavam commenced on 21st and today 26th July 2014 is day 6. During Thiruvadipuram, on all days there is purappadu of Sri Andal in the evenings. Today is Amavasai ~ and there was grand purappadu of Sri Parthasarathi and Sri Andal. Today it was the ‘kondai’ which added further beauty to the most beautiful Emperuman. I have recently posted about Thiru Mayilai Sri Adhi Kesava Perumal from ‘Kesava Perumal Kovil’ in Mylapore having Vana Bojana Uthsavam at Thiruvallikkeni. 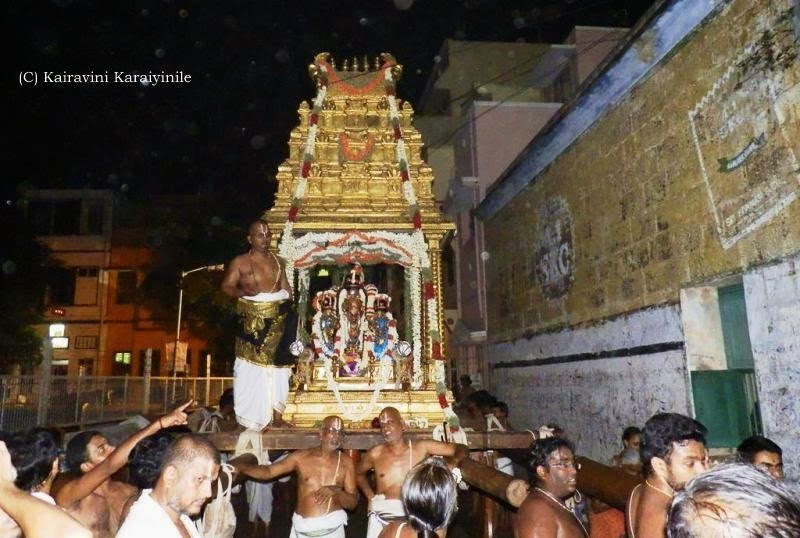 On 20th July 2014 in the evening, there was grand purappadu of Adhi Kesavar in the mada veethis of Thiruvallikkeni. Horses and pathagais preceded – after Divyaprabandha goshti – there was group Nathaswaram and instrumental music – arranged by Sri NC Sridhar adding to the grandeur. It rained heavily in between, Perumal took rest in the Gangai Kondan Mandapam, where Sri Parthasarathi and Sri Azhagiya Singar halt during every major purappadu. The purappadu continued after the rains and Thiruvanthikappu took place in front of Vanamamalai Mutt. Sri Adhi Kesvar then returned back to Thirumayilai in pallakku. Here are some photos taken during the thiruveethi purappadu at Thiruvallikkeni. Swami Nammalwar says …. ‘the most pleasant fragrance of jasmine –wafting breeze, ears receiving the pleasing kurinji music; Sun setting with beautiful red colours in the horizon – all attracting - but more attracting was the pleasing sight of the fragrant palanquin made of flowers – for they were set for the most beautiful ‘Sri Azhagiya Singar’. Today, 18th July 2014 is Pushpa Pallakkuu - after 10 days of Brahmothsavam, it was rest called ‘Vidayarri’ for Sri Thelliya Singar and after 3 days of rest comes the florally bedecked ‘Pushpa Pallakku – the palanquin with flowers’ . 14th July 2014 is the 9th day of Sri Azhagiya Singar Brahmothsavam – Theerthavari. In the morning Sri Azhagiya Singar had purappadu in “Aaal mael pallakku”. I had posted about the symbolic search whence Perumal Himself comes incognito, covered with ‘sheets’ (போர்வைகள்). Sripadham thangis carry the palanquin in a circular motion and with every circling round, one porvai is removed; aarthi performed – immediately after the uncovering of last sheet too - for a few seconds one can have darshan of Sri Azhagiya Singar with no floral garlands – then many flowers adorn Perumal. This year, I had the fortune of darshan during ‘Porvai kalaithal’ and here are some photos taken during the function. On the concluding day of Brahmothsavam is ‘Sapthavaranam’ – grand Thiruvaradhanam, rendering of Thiruvaimozhi and late in the night, there is purappadu in Siriya Thiruther [the small chariot]. Today, 15th July 2014 is the tenth day of Sri Azhagiya Singar Brahmothsavam at Thiruvallikkeni [Triplicane] divyadesam. It is ‘Chinna Thiruther’ famously known as ‘Vettiver Chapparam’… I had earlier posted of the scientific name of vetti ver as - ‘Chrysopogon zizanioides’, a type of grass of Poaceae family, native to India. Also known as ‘khus’ Vettiver can grow up to 1.5 metres high and form clumps as wide. The stems are tall and the leaves are long, thin, and rather rigid; the flowers are brownish-purple. Unlike most grasses, which form horizontally spreading, mat-like root systems, vetiver's roots grow downward, 2–4 m in depth. This is not intended to by any post on its characteristics.. This Ther is known as ‘Vettiver Chapparam’ – for there used to be so many sheets made of this grass placed on the temple car. One could feel the divine fragrance from a distance itself. Understand that the stem of the grass vettiver is cut, smoothened and made into a mat. These mats were earlier even used in houses and as the air passes through it, there would be fragrance and natural cooling of air. In the purappadu - Thiruvarangathu Amuthanaar’s ‘Ramanuja Noorranthathi’ was rendered. Here are some photos taken during the purappadu. At Thiruvallikkeni divyadesam – there are grand Brahmothsavams for Sri Parthasarathi in Chithirai and for Sri Azhagiya Singar in Aani, which is presently on – and today 14th July 2o14, is 9th day of the Uthsavam. On 8th day morning it is ‘VEnnak thazhi kannan’ for Sri Parthasarathi, while it is ‘Lakshmi Narasimhar’ for Azhagiya Singar. On Ninth day evening it is – Kannadi Pallakku – the palanquin embedded with beautiful mirror work for Sri Parthasarathi, - for Sri Thelliya Singar, there is no ‘kannadi pallakku’ but, the imposing – ‘Punniyakodi vimanam’. The most beautiful Azhagiya Singar true to His name, has purappadu from the Western gopuram, comes through Peyalwar Kovil street, ascends the Vimanam – first there was kulakkarai purappadu. When purappadu was on Thulasinga Perumal Kovil Street, it drizzled – Azhagiya Singar was covered and had purappadu in kedayam.